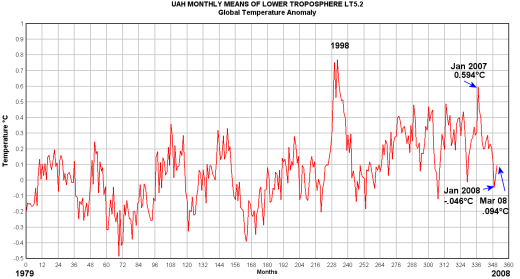 UAH Global Temp Anomaly: also slightly above zero | Watts Up With That? A few days ago I posted the results of the RSS Microwave Sounder Unit (MSU) global temperature anomaly data by RSS (Remote Sensing Systems of Santa Rosa, CA). For March 2008 it has moved a little higher, with a value of .079°C for a change (∆T) of 0.081°C globally from February. The GISS Feb to Mar temperature change is the largest one month change in the entire record based on my macro search. I have not verified that, but it seems plausible. We’ll see if GISS remains the outlier data set when HadCRUT publishes soon, I expect before the end of the week. April 8, 2008 in Uncategorized. How does the current Feb-Mar change look for RSS and UAH, compared to their past differences? Yet how many record snow falls did we have in March around the world? Does Hansen think people are idiots that will believe whatever nonsense he serves up to justify his crusade? Coldest Marsh since 2000 if I’m reading the data correctly. And lose the name of feedback action. – Soft you now! Could someone double check this for me. I’ve loaded up the UAH in excel and get now a linear trend line of about .132 C per decade down from the .14 of last month but the UAH trend still stating it’s .14 C? Could someone check what the current linear trend line slope is? …not to even mention the bank(quo) accounts. Hadley will have to make a decision. Something or someone is awfully wrong. Raven, March 2008 saw a considerable and negative snow cover anomaly across the northern hemisphere. Perhaps, after digesting that, you might withdraw your slur? As many skeptics are now monitoring climatic data as avidly as investors monitor financial data, please allow me to float the idea that you officially post a so-called: INDEX OF LEADING CLIMATIC INDICATORS, just like economists do for the US economy every month. We could use 1980 – 2000 averages as the baseline. Announcing the Index of Leading Climatic Indicators monthly would allow readers and audience to easily and quickly track what direction the climate is headed in. I think this would be a useful statistic that the general public could understand right off the bat. I think If FoxNews and other media networks announced the WATTS INDEX OF LEADING CLIMATIC INDICATORS every month, it would be an important service to the general public. The 7 components forming the composite I’ve listed above are just off the top of my head, and could of course be expanded, or modified. I was planning to do this myself on a website here in Germany, but I just don’t have the time for it. You’d do a much better job at it anyway. Hope you’ll find this idea interesting. REPLY: I like the idea, and I had tossed this idea around in the past, and even have a website registered for it “globalwarmingindex.com”. Perhaps it is time to look at this again. When I was a child I admired NASA. Now they are becoming a laughingstock. I hope they keep their paws off the satellite data. but of course 3 months Jan Feb March. Since it ain’t changed would estimate roughly 0.20C for March, 2008? The GISS divergence may have something to do with their extrapolation of the Arctic temperatures and the “big melt” in sea ice last year. They are clearly waiting for another similar event this year, so it is logical to adjust temperatures ahead of the actual melting season. This is just a wild guess and does not include any conspiracy theory. The data is checked for changes and fetched at 3am UTC/UTC+1 each day (and when I hear something has changed), so this should always give you the latest from each source. Note that these are anomaly readings and hence can have slightly different baselines, so it would not be fair to infer from this that (say) GISTEMP is consistently higher. The GISS data released for March is very interesting . When temperatures dived in January all four indicators showed it but when the March GISS has a positive step of 2/3 that magnitude the satellite data only shows a very small step . Very strange. Surely the GISS number is a misprint. If that is indeed their estimation then their land-only value must be an all-time record. I could be wrong here, but when I did a quick scan I found Jan-Feb 1935 to be the largest one month jump in the GISS Glb.Ts+dSST (with a temp change of +0.51 deg C). Nevertheless, 0.41 is a big jump, and seems somewhat at odds with the satellite data. Not drawing conclusions here, just observing. And, for fun, between the February and March versions, the values for 30 months were decreased by 1 and the values of 8 months were increased by 1. Not huge changes, to be sure. But, note that the addition of the March 2008 temperature was enough for the annual temperature of 1946 to now be colder than 1960 and 1972, and to drop 1903 into a tie with 1885, 1910 and 1912. There were five other times when the absolute value of the change was greater than +41: Dec 1899, Jan 1921, Feb 1935, Dec 1939, and Mar 1960. Interesting way to start my morning. Great work, I might like to post it on the Climate Clinic website. The GISS numbers are outrageous. I think we’ll see March 08 as the month that proved GISS totally irrelevant and nonsensical. How the heck do we top that? My first thought is it must be a difference in the selection of a baseline. We know the satellite baseline is from 1979 forward. Is the GISSTemp dataset using exactly the same baseline? We can show over and over that the selection of starting and ending points can make a big difference in the trend lines, and as we can see here probably in the mathematical differences. UAH is always slightly higher than RSS, so that’s not a surprise. GISS is just simply out to lunch. .5C difference from Jan to March? Pu-lease! Who do these guys think they are fooling? It’s insulting, really. Hansen is going to have 2008 in the top 5 regardless of the data. He’ll beat it into that spot whether it wants to be there or not. AW could you post txt file of all 4 indices again. When i looked at earlier on and compared it, there were some differences. What I find remarkable about both MSU datasets is the jump in land temps anomalies. It is nearly as large as the fall from Jan07 to Jan08, and remember, this is MSU satelite data not GISS. CRU UK may well not be as large an anomaly but I think it will be large never-the-less. That is a truly creative and immensely enjoyable adaptation of Shakespeares Hamlet except here perhaps it is an ode most fitting to the Prince of Darkness (Gore) rather than the Prince of Denmark (in this case perhaps Svensmark?). The largest change in UAH is .3, that being 1984. There were 28 months that exceeded .2 deg change. I have the breakdown of UAH, RSS and GISS, but don’t think that is the underlying issue other than GISS is extremely diverged from satellite. Keep in mind the land temp change was very large in both satellite data sets. It is the ocean data that intrigues me. In every case for UAH the oceans have cooled, except for SoPol which warmed by .01. A quick look from one year ago and the comparisons are similar, to me anyway. From Feb to March 2007, land temps rose, but ocean temps dropped…..every one, except SoPol which slightly warmed. This is speculative, but it appears the oceans are releasing large quantities of heat which shows up in land measurements. Given OHC is still stagnant or falling slightly, as the year goes on, in my limited perspective unless the oceans regain that heat loss (SST and deep), the only way for temperatures to go by year’s end is down. To me that is not a good thing. Certainly, the climate is changing, but it is the oceans that tell the real story. AW one very simple thing to look at is the average difference between GISS and hadcru. even though they use difference base periods differencing still works. anomaly, then HADCRU will report .58C ON AVERAGE. so bets on hadcru anyone? will hadcru report more warming relative to GISS or less. Given the bias in the way GISS has figured things in the past I wonder if they actually have any data on this or if it is entirely a figment of their adjustment process. Hold on, wait. GISS is land only? Why do we even look at that number then? That’s 1/3rd of the story…. I think I see the effects of Hansen’s thumb on the GISS scale. Face it, Hansen is just giving Kerry and Soros what they paid for. Looking closer on UAH, it appears NH warmed a bit, while the SH continues to cool. The tropics have cooled a tremendous amount. Almost 1C of cooling in the last 15 months. That tells me this was a very strong La Nina, and considering the tropics are cooler now than anytime in the last 15 months indicates to me La Nina is really persisting. jeez: Does this mean we get an “Out, damn’d spot” over in the solar section? My first thought is it must be a difference in the selection of a baseline. Whereas my first thought is that the satellites are measuring microwave proxies to determine the temperature of the troposphere while GISS is using (corrupted) surface stations to determine surface temperatures. I am still somehow not quite satisfied with the correlations and deltas. I trust Christy, don’t get me wrong, every bit as much as I distrust Hansen, but something still seems slightly skewy in the state of Bismarck . . . If you look at the RSS monthly anomaly chart for March 2008 (found here), you see that there is a very large heat anomaly over North Asia, spreading over to Eastern Europe, dipping down towards the Persian Gulf. The rest of the world seems pretty balanced and average except for this one “hot spot”. I wonder if GISS is responding to this as well? (Or rather, over-responding.) It isn’t very convincing when those who claim the medieval warm period wasn’t global when they get so excited about this event – which is clearly also far from global. I note that the largest RSS step (Dec 04-Jan 05, approx. 0.35 deg C) was a small step in GISS (less than 0.2 deg C). It may be that the measurement noise is sufficiently large that these sort of monthly comparisons are always going to throw up inconsistencies. March’s 0.67°C blows that out of the water. What is the significance? Probably the danger of reading too much significance in short term temperature change. REPLY: It only “blows it out of the water” if you beleive GISS and their polar estimates sans measured data that get included in their global anomaly index. Personally I don’t. Index of Leading Climatic Indicators is a clever/useful idea. “Raven, March 2008 saw a considerable and negative snow cover anomaly across the northern hemisphere. RSS breaks out the Continetntal USA. The GISS Northern Hempishphere anomaly was 140. I have put together a summary of all the different anomaly magnitude changes in the GISS data that meet or exceed the current month’s. (I use the metered readings only data, so it is different from this. I may change that around at some point, but relatively speaking, it’s showing the same thing). Does anyone know of some spot where I can get a good explanation of the differences between the four major measurement methods? I realize there are limitations, and I also realize that there is skepticism about GISS, in particular. But I am very interested in understanding the difference in methodology between measurements. Anything from different instruments to estimation techniques to the global reach of the measurements. I woould be indebted to anyone being able to point me in the right direction. The simple fact is there are billions of dollars invested in man made global warming hysteria, money that could have been much better spent on helping Africa get on its feet or helping China reduce its damaging emissions (SO2 and ash). Ash has a much greater effect on global temperatures, as once it comes in contact with snow it dramatically increases melt rates. I think you have a great idea. Do you know where up to date data (tide gauges or satellite) on the rate of sea level rise anomaly can be found? I have been looking for a source of this. When the HadCRUT number comes in, we should run the seasonal differences for all for four metrics for some recent period of time. The seasonal differences are the change from year to year for a given month. So for March 2008, we’d be comparing March 2008 to March 2007. Let’s do this, say, for the last 6-7 years. Unless HadCRUT comes out looking like GISS, the latter will stick out like a sore thumb. Another thing to bear in mind is that normally, the swings in the MSU data sets have been greater than the swings in the land/sea data sets. That makes the GISS jump even more anomalous. People who want to believe what they are seeing in the GISS jump will trump its superiority for measuring trends at the poles. Is there any way to independently assess whether the GISS jump can be accounted for that way? REPLY: I think this is a good idea. GISS uses estimates for the temps at the poles, and of course no actual surface data is used from these high latitudes. In my view the method is complete folly. Australia had an extremely hot March. Southern Australia had a huge heat wave that would have a big impact on anyone relying on just a small selection of surface temps like Hansen does. Purely from a mathematical standpoint, a difference of this magnitude between GISS and the other sources being attributed simply to the poles wouold have to mean that the anomaly at the poles is incredibly huge. Further, since it is apparent that the anomaly difference is primarily in the Northern Hemisphere, I would ahve to think that the GISS data would be saying that I would have preferred the March weather at the North Pole to the weather I had in Wisconsin. Peter, do you have a link to that data? So the base period is different. They do include SST it appears. Need to check hemisheres againts each other. My bet is that GISS overweights the NH measures. What scientific justification could they possibly have for that? By the way, just so you know, the NOAA officially–flatly–denies that the Medieval Warm Period was as warm as today and cites Mann et al. (1999). The hockey stick graph is introduced as visual proof of this. I did say in the middle of March that the March anomolies will rise because snow cover across the NH was below the 1995-2005 average during March. It looks like that I was right. Be careful of focusing on localized record snow events, because that can mislead you as to what the global picture is doing. As you can see, Asia currently has below average snow cover. Why is that? It could be the soot effect. It could be the warm phase of the AMO. Not offhand. I’ll see what I can come up with. My research skills are likely not better than yours. Maybe someone else here could help us out. But can’t locate the temperature data. Let me revise what ought to make up the Index of Leading Climatic Indicators: Maybe others here have more ideas on this. 8. A solar parameter, yet to be defined. I think a composite of the above would act as pretty darn good barometer as to where we’re headed climatically. We just need to find the data sources for no. 2, 7, and 8. REPLY: First I don’t care to have this named after me of the blog. LCI Index would be just fine. The biggest issue would be how to weight all these parameters, some may change very small numerically, but have a larger influence, some may change large numerically, but have little influence. I may be wrong but I believe that there is satellite data on sea level. Because they are crooks? Also because they need something outlandish to distract from the steady parade of AGW policy induced global famine stories that will be reported the rest of the year. And also because they are crooks. Yes. I would suggest running them as straight correlations and see how they “move” and correspond before assigning weight. Riffling through my electronic postcards . . .
By satellite temperature I assume you mean lower troposphere and not adjusted to surface. Atmosphere can be broken down to lower, middle, upper troposphere and lower stratosphere. Normally one would argue merely for lower trop., but middle trop. is significant because that is where the CO2-induced heat bubble suggested by the GCMs is supposed to accumulate. So I would consider including temps for at least the lower two levels of troposphere for a start. Also, what about water vapor content (positive feednback) as strictly opposed to cloud cover (negative feedback)? And is there a reliable overall albedo index to be going on with? If the Aqua satellite is (allegedly) correct, CO2 upward pressure may be affecting cloud cover, thus creating its own homeostasis. happened a handful of times since 1979. hey gore happens. is aligned with GISS discrepancy. When the gap between GISS and the satilite estimate increases, the gap between HADcru and the satilite record increase. I can only assume that this would be because GISS relies on land surface measurements and that most of the land mass (c. 70%) is in the Northern Hemisphere. There is no question that NOAA global surface temps are considerably warmer in July in spite of the fact that it is winter in the southern half of the globe. Either this is a land bias or it is completely legitimate (for various reasons I would not know of). Well, if what mosh says pans out, then what I said may hold: It may be a surface vs. satellite kind of thing and we mustn’t forget “how not to measure temperatures, no”? The bad surface stations? That’s what brought us here in the first place . . . The field of economics is very far along with the use of indicators. But with climate we’re still stuck with polar bear drownings and news anecdotes. This is astonishingly primitive for a science that is now playing a crucial role in policy making. We should just keep it simple, and let it evolve with time…just list each component individually at the end of each month., and say something like 5 out of seven indicators point to cooling, with ocean temperature (the big one) showing a drop. As it is now we’re getting statistics in dribs and drabs. A nice and neat summary at the end of each month might have a greater public impact. I like: Index of Leading Climatic Indicators because it rhymes with Leading Economic Indicators. A good name goes a long way in marketing! Egads! What would investors do if economic statistics were as primitive as climate stats! As already noted in some comments, it’s not. This increase has been exceeded twice. And similar increases (~+/- 10%) have occurred about half a dozen times. They are nonetheless in the wings of the distribution, obviously. It should be also noted that decreases with a similar magnitude have also occurred about half a dozen times. I’ve asked this before: at what time does a “regional” event become a “global” event? Percentage of surface area? It seems to be when it’s to the Pogies advantage. Re Argo ocean temperature, apparently you can get it from http://www.argo.ucsd.edu/FrArgo_data_and.html and I put in a request there for data but didn’t have much luck. Re my post on Skeptical Science about March temperatures, the whole point of the post was not to read too much into short term temperature changes. Not sure where the “biggest up swing ever in a two month period” quote came from. My big sweeping conclusion was “At best, we can surmise the La Nina cooling may have subsided”. Really going out on a limb there. If the event involves warming and it occurred recently then it is always global. If it occurred in the past then it is always regional. If the event involves cooling the it is always regional. Global cooling has been shown to be a physical impossibility by the climate models. The LCI is a great idea. You’re going to have to include the Mauna Loa CO2 measurements, too. 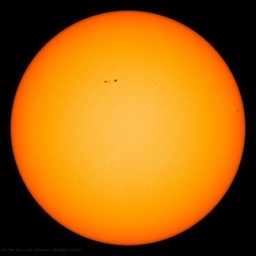 Also an albedo measurement will be a great indicator to match up with solar activity/cosmic rays. It will be very interesting to see which of the parameters best leads real temperature measurements. “We should just keep it simple, and let it evolve with time…just list each component individually at the end of each month., and say something like 5 out of seven indicators point to cooling, with ocean temperature (the big one) showing a drop. You hit the nail on the head. If our bureaucrats can’t understand or comprehend the little they’re supposed to do by law, how on earth can they understand a myriad of numbers. Perhaps two different sets of numbers would be even better: one for individuals seeking a more in depth view and the other for the Pogies and elected officials! I hope this isn’t off topic but I really am wondering about this. If sea level is rising and ice is at very high levels, where is the extra H2O coming from? Normally i would say thermal expansion. But as the ocean temps do not seem to be cooperating . . .
Perhaps there is thermal expansion warming ‘way. ‘way deep due to undersea volcanoes or something. Perhaps there is some uplift in the sea floor. And most areas are either sinking or uplifting. The old sea-witch “Axe” Moerner claims the IPCC carefully cherry picked its SL data from sinking areas (and dumpered his peer review on the matter) and SL actually has not been rising much at all. “I hope this isn’t off topic but I really am wondering about this. If sea level is rising and ice is at very high levels, where is the extra H2O coming from? Hey Mike, that’s a great question and one everyone seems to be wrestling with right now. This is especially stange in that SST have been dropping and the waters should be contracting slightly. Is there a global inventory of water? Sea level has been basically flat the last couple of years. (Three IIRC) Google-fu is failing me at the moment though. Maybe the Argo data hasn’t been adjusted and homogenized yet. Here at GISS’s site you can see why they are so much warmer. Click on Global Maps, and make the Mar 08 map with or without SST’s. Almost the entire Asian continent fried in March. 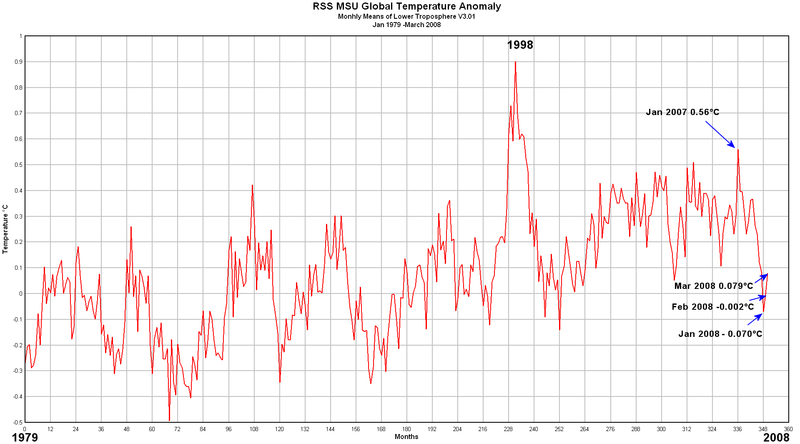 RSS does show it being much warmer in the same area, but GISS really seems to over do it. Mike, the ice that is at high levels is sea ice. Since it is floating in the ocean, it doesn’t influence sea levels. Only increasing ice on land in net terms will do that. This shows GISTEMP has been more variable *in both directions* recently, but there is something unusual about the last point, clearly. Basil: I was just about to add an “every” process which will allow selection of (usually) every 12 samples – then you can compare the same month year-to-year. Thanks for the link – exactly what I was looking for. Looking at the sea level data, it seems a sharp sea level rise occurred in 1997 just before the super 1998 El Nino. I’d say this was maybe due to thermal expansion. If this is not the case, could someone tell why this happened so? Crosspatch and Mattn, the amount of ice in Greenland and in the Antarctic dwarves all other ice on earth. This is the ice that some people worry about because it isn’t floating. Since this ice is at very high historic levels, and sea level is apparently also rising, it seems that we must have extra water. There’s probably a simple explanation for this. Actually the graph at http://sealevel.colorado.edu/ seems to have leveled off a little recently. I guess as the earth cools we should expect some lowering of sea level. Russian and Chinese surface stations 4 – 8 degrees above normal in GISS-Network in March 2008?? I doubt that! Question: Is there a climate audit going on for the Russian and Chinese datasets of surface stations? This seems to be the great +++ outliers compared to satelite measurements. Gotta track that problem down. Yes; the distinct mark of the heat sink. Exaggeration of temperature increase during warming. Exaggerated regression during cooling. Nonsense, old son. We are promised that all outliers are removed from data. Promised! Why, it’s Step One of the NOAA adjustment procedure (really). What you require is a greater trust in our great institutions. I find your lack of faith . . . disturbing. My theory is jeez is an alias of IowaHawk. How’s about a little soliloquy by Lear’s fool? Mike, I know what you’re talking about. I was being sarcastic (I’m kinda that way). I clicked the GISS map link supplied by climatepatrol, and the area on the map that is more than 4 above normal over Asia is incredibly HUGE! It’s hard to believe. I look at hemispheric 500mb weather maps frequently, and I sure don’t remember seeing such a vast area of anoumalously high 500mb heights on that side of the world last month. Maybe I missed it(?). March was the 52nd coolest for the US, just south of middle of the road. The map in the link I just posted looks a little different than the U.S. area of the GISS map. if the chicoms had any brains they would report freezing temps to spike the GSMT downward, so that they can burn coal without being bothered. More diabolical, they could report warmer temps so that everyone else would cut energy consumption and then they would win. Both China and Russia hope to make a pile of dough selling mythical carbon credits to Europeans so they have an incentive to report warming when there is none. We are promised that all outliers are removed from data. Promised! Why, it’s Step One of the NOAA adjustment procedure (really). gistemp station 205505270004.0.1 in Russia. I was not referring to such outliers. I mean GISS NASA as a March outlier in general because of their Russian/Chinese early spring “surface heat wave”. Gotta wait for NOAA NCDC. I don’t know what you don’t like about NOAA? Check out March 1990 – very similar anomalies . BTW Asia was very warm I mentioned this some weeks ago and that March was shaping up to be much warmer than Jan and Feb but was more or less dismissed. Note that to get comparable maps you have to change the GISS “base period” from the 1951-80 default to the the internationally used base period 1961-90 (and, yes, 1951-80 was appreciably colder than 1961-90). Now, this is getting interesting. If you change the smoothing radius from 1200 to 250 km, the colder than normal temperatures in western and northern Scandinavia show up clearly, but with a 1200 km radius the temperatures there go up more than one degree. That smoothing algorithm must be a real work of art. Another thing that shows up is the fact that GISS does not have a single station in central Scandinavia, which is quite ridiculous. There are any number of stations there, some of them (e g Trondheim and Östersund) with very long, good quality temperature series. In my opinion the researchers in climatology should put aside their work for a moment and focus their attention on the central and decisive subject of climatology. This is the extremely close correlation between the changes in the mean surface temperature and the small changes in the rotational velocity of the Earth in the past 150 years (see Fig. 2.2 of http://www.fao.org/DOCREP/005/Y2787E/y2787e03.htm), which has been ignored by the mainstream climatologists. Since temperature cannot influence rotation to the observed degree and vice verca, a third agent must be driving the two. The solution is given in http://www.icecap.us/images/uploads/Lobert_on_CO2.pdf .